L.I.T.E. Up Your Bike 2018 Contest Winners! Thanks to everyone who entered Lite Up Your Bike Contest! The winning entries photos are located here. To view all the entries, visit here. 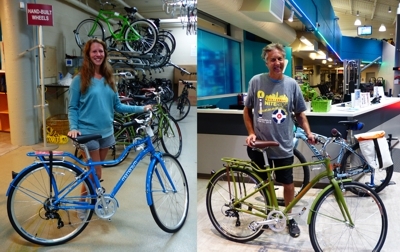 Bicycle Garage Indy and the NITE Ride are happy to announce the winners of the 2018 LITE Up Your Bike Contest. Congratulations to the following folks for their winning entries and to everyone for participating! Winners of the Great Bike Giveaway - Congratulations! 1. Sign up at the BGI table for the contest anytime between 4:00 - 9:15 pm (during the NITE Ride). 2. At 9:30 pm line up with your bike in front of the stage at Alabama and Market (NE corner) for photos of you and your bike. You can also take your own photo, post it on Bicycle Garage Indy’s facebook page (www.facebook.com/BicycleGarageofIndy) and tag them #LITEUpYourBike and #BicycleGarageIndy and share with family and friends. 3. The link to all the photos will be posted on Tuesday, June 26 for voting on www.niteride.org. 4. Share the link with family, friends, co-workers and encourage them to vote for your photo. Winners will be determined by number of votes received. Any ties will be resolved by contest sponsors and NITE Ride Director." 5. Voting ends start on Tuesday June 26 and end Sunday, July 9 @ 5 pm EDT. 6. Winners will be announced by Monday, July 10.